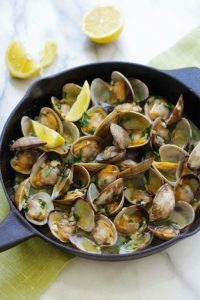 Sauteed Clams – Cooked in your favorite frying pan, these clams with loads of garlic butter, white wine and parsley are the easiest sauteed clams recipe ever, It will take you a mere 15 mins to make! Every fine seafood restaurant has a section of the menu dedicated to shellfish and sauteed clam is always on top of the list. 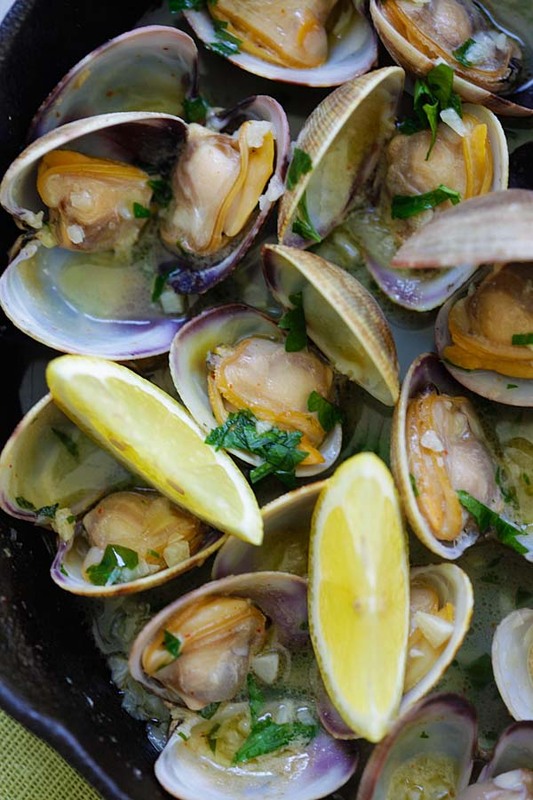 These delicious clams are cooked with a combination of garlic, butter, olive oil, parsley, with lemon juice. It’s really simple to follow this recipe and the results are but absolutely gourmet. Add the clams into the skillet, and quickly toss around with the spatula. Add the wine and cayenne pepper. Cover the skillet and let cook for 1 minute, or until the clams are all open. Add the lemon juice and parley, stir to combine well.